If you’ve got an iSight-equipped Mac, you’ve probably tried out Photo Booth, Apple’s digital recreation of that discount store staple. You may have even found it somewhat fun to use, and perhaps you’ve accumulated a nice assortment of images that you’d like to bring into iPhoto. Photo Booth includes an iPhoto button just for that purpose—but it only works on one image at a time. That’s not so handy if you’ve taken 20 pictures that you’d like to import into iPhoto. Thankfully, there are two workarounds to quickly import all your Photo Booth images into iPhoto. Photo Booth conveniently stores all of its photos in your user’s Pictures folder, in a subfolder named (surprise!) Photo Booth. Switch to the Finder, navigate to that folder, open it, select all the images (named Photo 1.jpg , Photo 2.jpg , etc. ), and then drag and drop the selection on iPhoto’s icon in the Dock (or into iPhoto’s main window, if it’s already running). As with any dragged selection of images, iPhoto will import them all into a new film roll, ready for your use. In the Library column, click Finder, then drag the Get Specified Finder Items action into the blank work area. Click the + sign at the bottom of that action’s box, and then navigate to your user’s Photo Booth folder, inside your Pictures folder. Now drag the Get Folder Contents action (also in the Finder Library) to the work area, below the previously added action. Click on the iPhoto entry in the Library column, and drag the Import Photos into iPhoto action to the bottom of the work area. You can then use the radio buttons to either import the photos to either an existing or new album. If you check the Delete the Source Images After Importing Them box, Automator will remove the pictures after they’ve been imported to iPhoto. You may wish to leave this option disabled, just in case anything goes wrong with the import. Now all that’s left is to save your new workflow as an application for easy use. Select File -> Save As, and set the File Format pop-up to Application. Name your new program (Photo Booth Importer), and store it somewhere safe, like your user’s Documents folder. To make it easy to use your new app, drag it to the Finder’s toolbar or sidebar, or into the Dock. 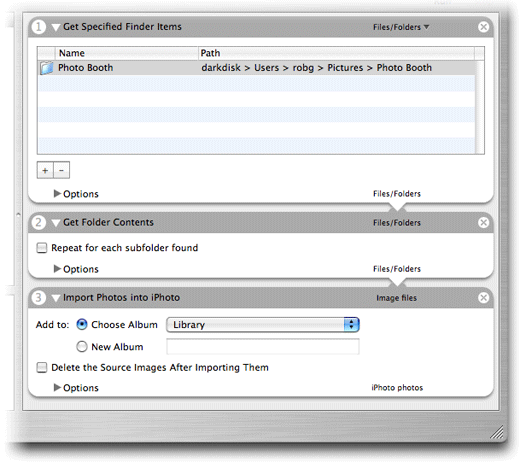 When you’re ready to import your Photo Booth images to iPhoto, just run your new Automator application. It just doesn’t get much simpler than that!